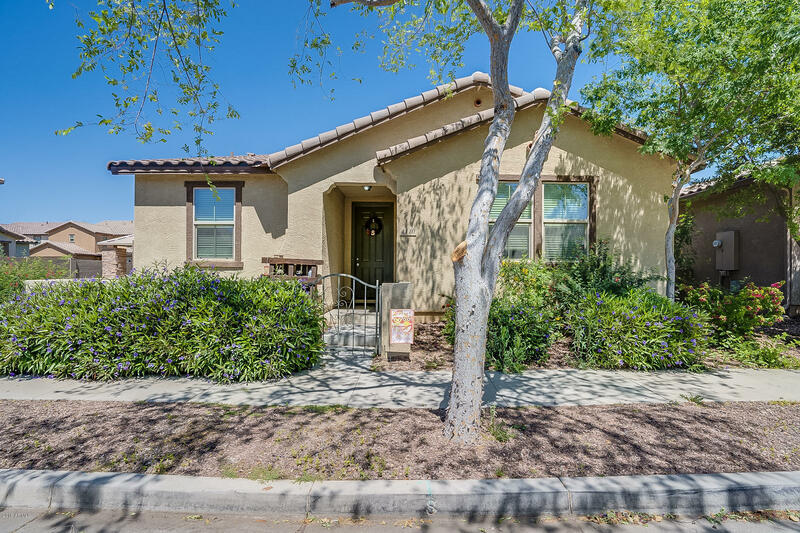 Wonderful 3 Bed 2 Bath plus Den single level home nestled in the desirable Copper Ranch community! This 1837 sq. ft home features 20x20 neutral tile flooring set on the diagonal, 9 ft ceilings, faux wood blinds, and a desirable great room floor plan. The gourmet kitchen features 42 in. cabinets, granite countertops, black appliances, double ovens, electric cooktop, pull out shelving, and large breakfast bar perfect for entertaining and quick meals on the go! The den right off the great room can be used as an office, play room, exercise space or 4th bedroom. Master Bedroom features a full bathroom complete with separate shower & tub, walk-in closet, double sinks, and separate toilet room! Enjoy relaxing on the patio or step outside and take advantage of the community green space & ramadas right next to the house. Community amenities include multiple playgrounds, community pool & spa, beautiful parks, basketball, and exercise paths! Prime Gilbert location right cross from Cooley Middle School, easy access to the 202 and less than 10 minutes from all the shopping and restaurants at San Tan Village Mall, Top Golf, Cosmo Dog Park, Joe's Farm Grill, Barnone, a new LA Fitness, and more!